The cities are a carpet of speeding motorbikes and a ceiling of electrical wires. The beach towns have come to be likened (by some) to the craziness of Vegas. And the North is home to a mystery of culture and intrigue. This is Vietnam, and no trip to this incredible country is complete without escaping the intensity of Ho Chi Minh City to venture into the water world of the Mekong delta. 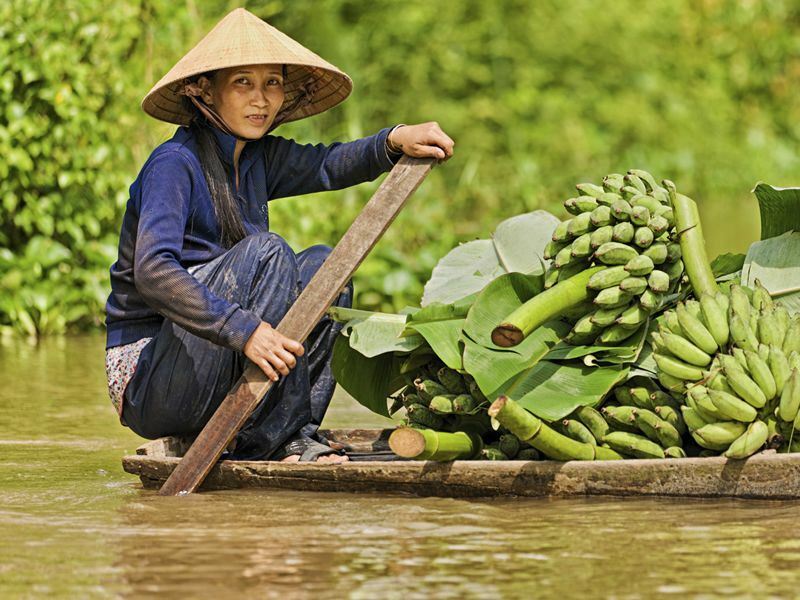 Fed by the mighty Mekong River and nicknamed the ‘rice bowl’ of Vietnam, the many muddy rivers and swamp lands make it possible to feed the entire country and more. And as you float along the waters, you will begin to understand how it functions as home, market, highway and leisure centre. This region is home to countless captivating experiences that will be sure to leave you with a fuller understanding of Vietnam, its people and its geography. There are a number of options available in getting to and from this area ranging from the all-inclusive, to the free and not so easy. If simplicity is your main draw, then look no further than a Saigon tour operator. Offering multi day trips, this will include all transport, accommodation and entry fees plus a delightfully chirpy tour guide – expect lots of sing-alongs from a few of the older generation! Many of these tours are, with want of a better word, touristy and a little on the cheesy side. However they are an experience in themselves and, if you are open to the cheese, can be a lot of fun! A day trip from Ho Chi Minh will take you about as far as My Tho where you will get the chance to venture onto the smaller tributaries around Ben Tre. Imagine yourself in a canoe steered by a lovely little Vietnamese lady wearing an infamous conical hat, and you get an idea of what your trip may involve. These beautiful, bamboo lined mini rivers act like a network of streets in a neighbourhood of little wooden houses and some very interesting farms… Ever wanted to know how they make coconut candy? Ever even tried, or heard of, such a sweet? Well head on an organised trip and you will! How about a honey farm? Or want to hold a boa constrictor? These hilarious trips really take all inclusive seriously! A particularly interesting stop on the route is seeing how rice noodles and rice paper (used to make delicious Vietnamese fresh spring rolls) are made. The farms you visit will still be using what seem like centuries too old equipment but the people using them are skilled and efficient and it is fascinating to see them work. Food is such a huge part of life in Vietnam, which is probably why many tours are so heavily food orientated. Such a day trip can be gratifying however to see the main attraction- the floating markets, an overnight stay in Can Tho is necessary. Can Tho is the biggest city in the area and is an easy place to spend a night exploring riverfront restaurants and possibly even a night of Karaoke- a Vietnamese favourite. Heading to Cai Rang floating market early in the morning will be the highlight of your Mekong trip. Seeing the hundreds of boats floating in to sell their wares, right on the water, is an outstanding sight. Typically each boat is devoted to selling one thing and it is pretty incredible to see piles of pineapple, watermelon and even a mini spring roll station floating along the river. Most people advertise with an example of their goods perched atop a long stick, rising above the commotion with pride. Photo opportunities abound in this simply, everyday trip to the shops. Possibly even more interesting is getting onto dry land to one of the many more un-floating markets. However, market wandering in Vietnam is not for the faint hearted. Again, all-inclusive is on overload with lacy underwear sold next to pig’s heads and frogs skinned alive. But if you can look past the gruesome, it is a chance for some perfect people watching. Seeing how the locals barter with each other is a great travel lesson! Despite the countries love of such organised tours there is ample opportunity to explore the region yourself. Simply hire one of the many motorbikes available in the city, don a helmet and dodge the inner city traffic. Be sure that both you and the seller understand the contract (costs of accidents and repair etc.) before you hand over any money or a passport though! Once you get out of the city the delta is your oyster! Why not visit more than one floating market at both Phong Dien and Cai Be? Or maybe you want some beach time? Make your way to the gulf of Thailand and visit Phu Quoc Island, the Mekong’s Caribbean. Or head to Chau Doc and experience it’s abundance of cultural and religious diversity, before catching a boat to Cambodia and following the Mekong River’s journey North experiencing a whole new fascinating country. More information and to book: View the fantastic 9 day Essential Vietnam Tour – a really good introduction to Vietnam covering all the main areas and sights that are to be found in this magnificent country.